If you love Chiang Mai temples like I do, this is a must see. Glistening golden Wat and beautiful grounds. Beat to go early to avoid the crowds, but if you cant...anytime will work, small entrance fee and food on the grounds. Please be respectful as with all temples, people do come to worship. 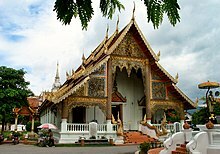 If you are planning to visit the temple don't forget to go to "Wat Phra Singh". It's easy to travel and near walking street on weekend. You will see the big Golden pagoda and beautiful temple with Lanna architectures. Good to see while you are here. Wome great stuff. Only complaint i have is they charge you to see the inside of the temple (which is not that big). Oh my goodness, so beautiful! ฿20 entry fee is well worth it! Definitely swing by if you are in the neighborhood. A very big wat and surprisingly they do not charge. The bling is obvious! And the the life-like wax statues of several monks are quite impressive-maybe as good if not better than madame tussaud. Worth it! On the way there perhaps visit JP chicken a very well reviewed place that sell roasted chicken. I did not cause was not hungry but very well regarded as a good place to eat.